Heathcote Health presented their Annual Report and Financial Statements for 2014-2015 at the 21st Annual General Meeting held at the Heathcote Senior Citizens Hall on Thursday 12th November 2015. Please click on the link provided for an electronic copy of these reports. Copies of the Annual Report and Financial Statements for 2014-2015 are also available on request by contacting Reception on 5431 0900. Annual Report & Financial Statements 2014/15. Click the ‘Read More‘ button to find out more about what went on at the AGM. Heathcote Health’s 21st Annual General Meeting was held on 12 November 2015 at the Heathcote Senior Citizens Hall and was well attended by members of the Heathcote and district community and health service stakeholders. Attendees were provided with copies of the 2014/15 Annual Report, Financial Report and Quality of Care Report for Heathcote Health. In his report, Board Chair of Heathcote Health, Mr Wayne McKay, provided an outline of the performance of the health service over the past twelve months and spoke of a range of projects undertaken by the health service, as well as providing an update on some of the exciting new initiatives Heathcote Health is currently undertaking, including the refurbishment of the Aged Care facility. The guest speaker was Ms Maree McCabe, CEO of Alzheimer’s Australia Victoria who gave an entertaining and highly informative talk on dementia. Ms McCabe’s presentation touched on the types of dementia, diagnosis and treatment and described her own personal experiences with caring for a loved one with dementia. She also outlined the 10 key principles for a truly dementia-friendly community, and noted that increasing community awareness and understanding of dementia was paramount. Ms McCabe also explained how Alzheimer’s Australia Victoria provide education, support, advocacy and information to empower and enable the thousands of Victorians living with dementia, their families and their carers, and highlighted some of the new initiatives the organisation was currently working on. The Board of Management announced Ms Pat Barri as the health service’s latest Life Governor, acknowledging her commitment to the health service over the past 40 years as a staff member and volunteer. Ms Barri was presented with a certificate and her name has been added to the Heathcote Health Life Governor Board located in the Administration corridor of the health service. The meeting concluded with the presentation of service recognition awards for staff and volunteers, and an expression of appreciation for the valuable contributions made during the year by past and present staff, volunteers, and Board Members. Please click on link below to download the Board Chair’s Report as presented at the 21st Annual General Meeting on 12th November 2015. 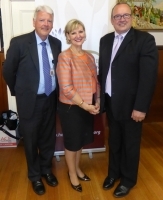 Pictured above (L-R): Heathcote Health CEO, Dr Dan Douglass, Alzheimer’s Australia Victoria CEO and AGM guest speaker Ms Maree McCabe, Board Chair Mr Wayne McKay.